The excavations led in Aprhodisias by Turkish archaeologist Kenan Erim have revealed marvels. The name of the ancient city has the same root as “aphrodisiac” a word that derives from the name of Aphrodite, the Goddess of Beauty and Love who was also the symbol of life and fertility in all its aspects. This city was dedicated to her. Founded in the 5C BC, the capital of Caria was very florishing during the Roman period because it had obtained, from Mark Antony, the status of free city as well as the inviolability of the sanctuary. 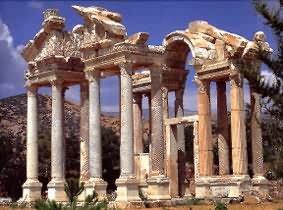 Aphrodisias was a religious, artitistic and literary center, and its school of sculpture was extremely reputed (sculptures were carved from Carian marble, a white,grayish blue local marble). The licentious and very popular cult of Aphrodite survived Christianity during a long time. This is why the Byzantines changed the name Aphrodisias into “Stavropolis” (the city of the Cross) and the temple into a church. The Propylon orTetrapylon is a monumental gateway built in the 2C AD under the reign of Hadrian, at an intersection where a sacred way led to the Temple of Aphrodite. 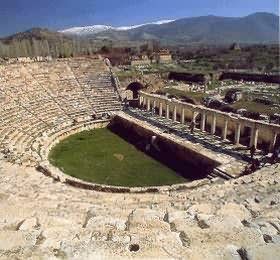 The Stadium built in the 1C AD, is the best preserved in Anatolia. It is 262m/240yards long and 59m/54yards wide. 22 rows of seats have a capacity of 30,000 spectators. The Temple of Aphrodite from the late Hellenistic period, was originally designed as an Ionic Temple with 40 columns. It was modified and converted into a basilica by the Byzantines in the 5C AD. The goddess Aphrodite altogether was the compassionate mother of all life who brought fertility and relief from sickness, and the goddess of love and war. The Bishop’s Residence was an ancient Roman governor’house later used by the Byzantine bishop. The Odeon is a semi-circular building with 12 tiered rows of seats decorated with lion’s feet. It had a capacity of 1,700 people. The orchestra was ornemented with mosaics and statues which can be seen in the museum. The Odeon was linked to the Agora by a porticoed area adorned with statues of important inhabitants of the city. The Portico of Tiberius has its central area occupied by a huge pool. The portico with its Ionic colonnade, may have been a gymnasium. 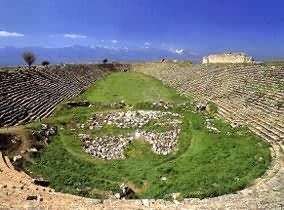 The theatre with a seating capacity of 10,000 people, was built in the late Hellenistic period around 100BC, and was modified at the end of the 2C AD. The Tetrastoon from where people had access to the theatre, was a meeting and a market place with small shops. The theatre Baths with the Imperial Hall. storied porticoes on both sides, where the emperor was worshipped. 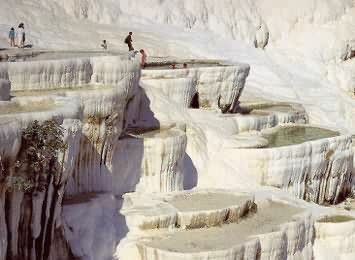 Located near Denizli, Pamukkale which means “ Cotton Castle”, is a unique naturel site that has always been reputed for the healing powers of its calcite-laden hot springs (35 C/102 F). The waters leaving their limestone deposits have created an unreal landscape, made up mineral forests, petrified waterfalls and a series of terraced basins and fascinating stalactite formations. 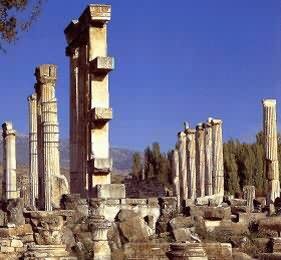 The ancient city of Hierapolis was founded in the 2C BC by Pergamum king Eumenes II who wanted to compete with Laodicea. It was named after Hiera who was the wife of Telephos, the legendary foundater of Pergamum. In 133 BC, the city was bequeathed to the Romans. Destroyed by a terrible earthquake in 17 AD, the city was rebuilt, and then became a very prosperous thermal resort until the 3C . Like in Laodicea, a large population of Jewish people who lived here, contributed to the expansion of the Christian belief. During the Byzantine period it was the diocesan center. Pamukkale has been declared by the UNESCO to be one of the Eminent Cultural Heritages of the World. The Necropolis is the largest ancient cemetery in Anatolia with approximatively 1,200 graves of different shapes: tombs, sarcophagi, tumuli... There are many Christian tombs because the faithful wished to be burried near the place where the Apostle Philip was martyred. The Martyrium, built in octogonal shape in the 5C on the spot where he is said to have been stoned to death. The Basilica ( 5C) was originally a 2C-3C transformed Roman bath. The Triple Archwas the northern gateway and was flanked by two circular towers. The Colonnated Street is 1,190m/1,088yards long. The Public Roman Baths are huge buildings were the local museum has been opened. The Sacred Pool contains many fragments of columns lying in the water. It is not to be missed because today it is located in the Pamukkale Motel. 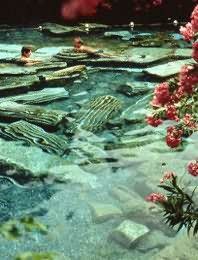 An unusual swim in the thermal water through the remains of the columns (or a glimpse) is recommended. The theatre with a seating capacity of 20,000 people, is a 2C well preserved building where reliefs depicted Emperor Septimus Severus and Dionysos.